For the past 83 years, Budd Lake has been the home to the New Jersey Vasa Park with their property located on Wolfe Road. Vasa Park, which is organized to promote and support Scandinavian-American culture, is the only residential cultural center in the State of New Jersey and one of only two facilities in the nation that provides a residential element to the cultural center. “We presently operate the Park with 87 homes.” Vasa Park President Ken Kallman noted. “We truly have a gem of a facility with over 125 acres of open space that includes a 10,000 ft Cultural Center, a beautifully designed outdoor pavilion, beautiful playground, three-acres of a tree-lined picnic grove, along with the centerpiece of the community, our 500,000 gallon swimming pool that is supported with amenities such as a patio bar, snack bar, and rest room and shower facilities”, added Kallman. Along with the 87 homes, New Jersey Vasa Home offers seasonal cabins to their out-of-town members that want to spend time in the summer enjoying the tranquil setting that the park provides. According to New Jersey Vasa Park, there is a 5-year waiting list to rent a cabin for the summer. According to Kallman, “The interest in our park has grown tremendously over the past few years. New generations of membership have led to younger families with children using the facilities on a more consistent basis. Starting with the 2019 pool season, which will run from mid-June to Labor Day, Vasa Park will be opening up their doors to the general public for pool memberships. 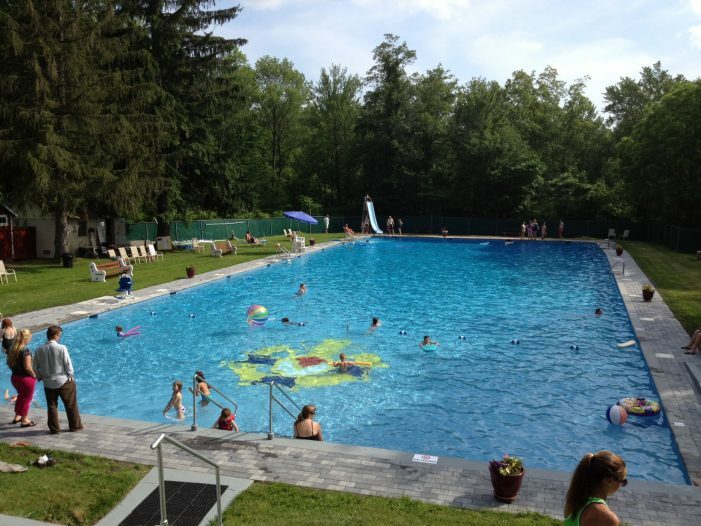 Being a self-managed property designed for the enjoyment of their members, New Jersey Vasa Park does not have to operate under the same guidelines as does a commercial facility with regards to pool memberships. Park Secretary, John Hanright added, “We are more focused on operating a park that provides the amenities our members want, at a cost that does not add a burden to their lives. We want to extend that courtesy to the general population as we look to open our doors to the public, so that the beauty of the park can be enjoyed by others”. Although all interested parties will need to be sponsored by a current member of NJ Vasa Home, that process is simple and comes with no added cost. “Our entire Board of Trustees at Vasa Park are in agreement that opening up our park to the public to enjoy our pool and other facilities is a wonderful opportunity, interested families simply need to contact us for those details”, noted Ken Kallman. For the 2019 Pool season, the rates are available now and include the following details: Full-season family pool passes will be $250.00, individual pool passes will be $140.00, and the hours of operation will be Mon. through Thurs. 1:00 pm to 6:00 p.m., Fri. through Sun. 12:00 p.m. to 7:00 p.m.